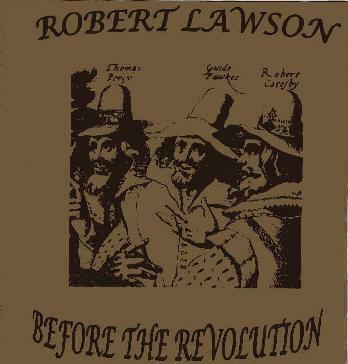 Robert Lawson - "Before the Revolution"
I recently reviewed Robert's previous release. Robert is a guitarist based in Spain who often records all the instruments himself and produces some interesting, mostly instrumental music. This CD includes only 3 pieces of music and a full band. It is a very laid back 32 minutes of music and quite stoned. New Goose Boogie starts things off and the band lays down a steady groove over which Robert plays lead guitar. The organ is used in a droney way and this leads straight into the old Coltrane track, My Favorite Things. This is a very loosely arranged version but it really lets Robert stretch out the guitar while coming back and forth into the classic riff. Bingo for Ringo ends the CD and is a slow track with some stylish, melodic wah guitar. Nice. For more information you can email Robert Lawson at: tinytapes@yahho.com.